Mrs. Boggs and the Turnip patch, "Pistachio" - the kid made out of balsa wood, male things, choosing up sides. Shep quickly runs through these items in his opening comments during the first few minutes of the show. He reads an article from Blyville Arkansas about a Deacon asking the lord to strike his congregation all dead. They all turn on him and everyone ends up in court. Shep sets the topic of the show by mentioning that is the heart of cantaloupe season in the Midwest. 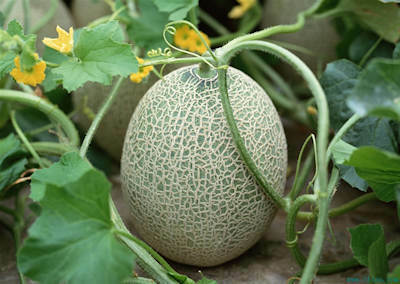 He, Flick, Schwartz and Bruner go out to the river on their bikes and come across a cantaloupe patch. After a discussion about stealing one, they decide it is too light out and they should come back after dark, Even though they all had cantaloupes in their refrigerators back home, they felt the need to steal one. They go back home, eat supper and hang out until it gets dark. Then Shep, Flick and Schwartz hop on their bikes and return to the field just out of view of the farmer's house. Accompanied by owls, mice, muskrats, black snakes and all the other creatures that come out at night, they sit there cutting open cantaloupes and eating. After eating their fill they decide to take some home and just as they were about to leave a dog starts barking. A door slams in the distance and the farmer is silhouetted in the moonlight at the top of the hill. "Who's down there? Who's down there in that field?" The shot gut goes off and there is the sound of bees going past the boys ears. Flick gets nicked with one of the pellets. They take off and don't stop until they come to the gas station where they all run into the men's room and unleash all the cantaloupes they had eaten. "Crime does not pay!" Shep yells at Leigh. "It pays for the producer to pay attention!"